EL CAJON – The 2017 season has been a veritable hit parade for the Grossmont College baseball team. The Griffins’ started with a road-heavy schedule that was plagued with rainouts, cancellations and site switches that resulted in a 3-6 record nearly a month into the season. On Thursday afternoon at Noel Mickelsen Field, the Griffs clinched their second-straight Pacific Coast Athletic Conference championship in overwhelmingly fitting fashion, scoring 26 runs against visiting College of the Desert in a 26-3 win on Sophomore Day. Grossmont College raised its team batting average to an uncanny .327 with a .484 team slugging percentage and 31 home runs in 36 games. The series against the Roadrunners was expected to be a victory lap, of sorts, but Grossmont still had to take care of business this week in order to keep formidable second-place challenger Palomar just one-step behind. 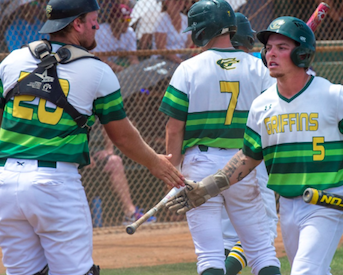 Grossmont (21-2, 28-7-1) remains one-game ahead of the Comets with one game to play tomorrow, but the Griffins clinched the season series with Palomar with a 2-1 series win last week. In the blowout of the ‘Runners, sophomore CABOT VAN TIL homered and had five RBI, while sophomore DAVID MALDONADO had five hits and scored five runs, as Grossmont turned on the afterburners after leading 5-0 after four innings. Santana product REECE HERNANDEZ lifted his average to .336 with a 5-for-7 outing in the contest. Grossmont added insult to injury with 10 runs in the last of the eighth. DONAVON MCCRYSTAL got the title-clinching start and was throwing a no-hitter when he was removed through six frames. McCrystal, a sophomore from West Hills High, struck out three and walked one to improve his season record to 9-2 with a 2.04 ERA. Three relievers all allowed a hit in one inning of work each. Another former West Hills pitcher, JEREMIAH BARR, dealt a scoreless inning. JALE SIM homered for the third time this season and had three RBI, while sophomore JUSTEN BURKEY also drove in three with a pair of hits, including a triple. Sophomore NOAH STROHL opened the scoring with a two-run single in the first, as GC scored four runs. ERIC DE LA ROSA had a season-high three hits, while scoring four runs and drove in two. During pregame introductions, the sophomores were all honored and their impressive list of four-year college destinations were also announced during the festivities. Grossmont wraps up the regular season Friday at 2 p.m. at College of the Desert in the series finale. The Griffins have advanced to the postseason.